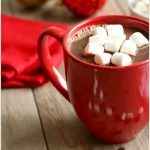 The Instant Pot is a perfect vessel to heat hot chocolate and keep it warm. This version is a twist on a classic. It has notes of salted caramel and it’s just a dream! Perfect for holiday merriment! Pour all ingredients into the Instant Pot and stir. There are 3 different methods to heating your hot chocolate. Saute: The fastest is the saute method. Turn your Instant Pot to the saute setting. You’ll need to whisk often until the chocolate is melted and incorporated so it doesn’t burn. Slow Cook: If you have more time you can put the Instant Pot on the slow cook function on the highest setting. Check back every 30 minutes and whisk until it is heated and all the chocolate is melted. This will take about 1 1/2 hours. Yogurt: If you have a yogurt button on your Instant Pot you can use that. Cover your pot and secure the lid. Touch the yogurt button and then adjust to Boil. This method takes about 40 minutes. Halfway through the cycle (20 minutes) open the pot and whisk. Then put the lid back on. Once the timer beeps indicating the boil cycle is done remove the lid and whisk the contents of the pot. Whisk very thoroughly. Turn Instant Pot to the keep warm setting. Serve hot chocolate in mugs with marshmallows and whipped cream. If there are leftovers you can pour the hot chocolate into a pitcher with a lid and store in the refrigerator. Each time before drinking, stir with a whisk. I used my 8 quart Instant Pot Duo*. You can also use your 6 quart Instant Pot Duo 60 7 in 1*.